Soda Blasting - the safe way to strip paint. Soda blasting is a new paint stripping technology that propels a bicarbonate-of-soda media (via compressed air) onto the area to be cleaned. This process removes paint and contaminate without harming the substrate surface. Blast material is a specially formulated sodium bicabonate: a non-toxic, non-hazardous food-grade material that is 100% water soluble and a completely environmentally safe product. 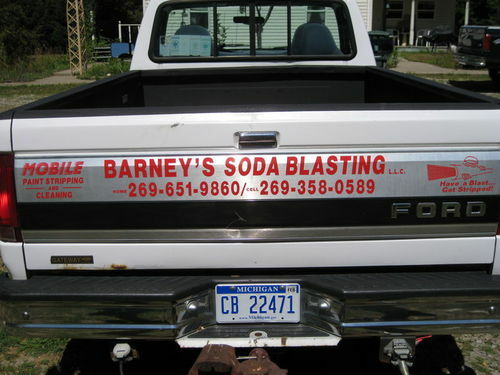 Soda Blasting is simply a better way to remove surface contaminant on metal. Sand blasting is very damaging to the substrate because it will stress-relieve the metal surface, causing it to bend or warp (known as oil canning).